Kevin Patton: Many years ago, I arranged for my body to be donated for anatomy education. That way, I can keep on teaching A&P long after I’m dead. Kevin Patton: Instead of content updates this time, I want to share a few bits of information about this podcast before we get to the featured segment in this episode, which I think you’ll really enjoy and learn from. First, I want to briefly tell you about the relatively loud volume of each episode. It’s probably louder than some of those other podcasts you listen to. That’s intentional. One of the many things I’ve had to learn once I started podcasting is that loudness is an important thing. Well, okay, I kinda knew that, especially because I have a moderate hearing impairment and even wear hearing aids to help me, so yeah, in my life, loudness is important. Kevin Patton: But I’ve found out it’s also important for podcast listeners in general. That’s because, besides there being some folks, like me, who struggle to hear conversations and audio presentations, even music, at what most would consider a normal level, there are also folks who use devices that handle amplification differently. So, what sounds okay on those nice stereo speakers on your desktop computer may not be so great on that cheap pair of ear buds on your mobile device, or on your car’s audio system when you have the fan cranked up and the traffic is cranked up. Audio engineers recommend setting the loudness at a particular, somewhat loud level, because, in most cases, it works really well to turn the device volume down if the audio file is loud, but it often does not work well to turn the device volume up if the audio file is already at a low volume. Kevin Patton: I find this happens a lot. There’s some podcasts that I really like, but I can’t hear all of it because, even at full volume, it’s just too low for me. Besides that, some outlets for podcasts, such as Spotify, and smart speakers like Alexa, require that high volume setting that I use. The process I use to achieve the required volume level also evens out the volumes a little bit so that there aren’t really any loud segments or any really soft segments. Of course, in real life, some things are louder than others and this process doesn’t take that away, but it does adjust the average volume so that once you get your device volume set, you can leave it there for the whole episode, and the episode after that. You also know that I’m still learning how to podcast, so any feedback you can give me about what’s working for you and what’s not, please let me know, especially regarding sound because, well, I just can’t hear that well and so I might be missing something. Kevin Patton: When you hear the term AAA, what do you think of? A lot of folks think of the American Auto Club, but even though I’m a member of that organization, what comes to mind first for me is the other AAA that I belong to, the American Association of Anatomists. I’ve been a member for many years and I get a lot of value from my membership. One that pops into my head first is the journal, Anatomical Sciences Education, which is focused on both anatomy education and combined A&P education. I’m a regular member, but there are many membership categories. For example, if you’re a member of HAPS, Human Anatomy and Physiology Society, you’re eligible for a greatly reduced membership fee in AAA. Another perk of AAA membership is access to a lot of awards and grants. Kevin Patton: I just received word that I received one of these grants to support searchable transcripts of each episode in this podcast. As you may know already, providing transcripts makes it very easy to go back and find a past episode about a particular topic, or that mentioned a particular person, or a resource, or whatever. You can’t Google audio files, but you can perform a search on transcripts of audio content. There’s even a built in search bar at the bottom of each webpage at theapprofessor.org, so, thank you AAA, for the first time I can announce that the searchable transcript available for this episode is supported by the American Association of Anatomists. Check out the many benefits of AAA membership at anatomy.org. Kevin Patton: I’ve mentioned the TAPP app before. Remember TAPP t-a-p-p is the acronym for The A and P Professor. The TAPP app is available for Apple IOS, Android, and Kindle Fire OS devices, and it’s got a lot of features. For example, there’s a car mode that rotates your screen to display a really large playback control that you can use while you’re driving, or biking, or doing something else where you can’t really pay attention to the app very safely. It’s got streaming access to play episodes from anywhere. It’s always updated with the latest episodes, and even has an archived back catalog. It has playback resume, which is helpful when you’re interrupted by a phone call, or a student drops by, or some other distraction. And there’s quick access to all the contact methods for the podcast, like calling in, or emailing, or the web, or twitter, but not carrier pigeon. I tried that, does not work out too well, those things poop all over the place. The app also has playback controls like continuous play, repeat and repeat off, changing the speed from one time to one and a half times, to two times normal speed, if you really want to get through it fast, or you’re tired of me talking slow, or having a lot of pauses. There’s even a sleep timer on there so that when my podcasts put you to sleep, it’s not going to keep on playing even after you’ve dozed off. Kevin Patton: But, there’s also bonus content and that’s what I want to focus on right now. For example, when I released episode 38, featuring media professor and copyright expert, Barbara Waxer, on the app, I also released a pdf file with a list of urls that Barbara had sent me that take you to some really great curated resources of images, videos, and other content that we can use right now in our teaching. There’s also example handouts for the first day activities, translations of bone names, and a lot more. They’re all supplements to and examples of things we’ve discussed on past episodes of the podcasts. You can download any of those files and keep them on your drive, or print them out, or do whatever you want with them. So, if you already have the app but didn’t notice the bonus material, go back and have a look. Kevin Patton: Another great thing about the app relates to a homework assignment I have for you all. Your homework is to think of one other A&P teacher you know of, just one, and tell them about this podcast, why you listen, what you get out of it. Maybe someone in your department, or maybe one of the adjuncts you only see for a moment as you’re leaving and they’re arriving on campus. Somebody teaching A&P at that school across town, or in the next town over. Even if it’s someone you don’t really know, hey, this might be a good icebreaker to start a peer relationship with a new colleague. Kevin Patton: What does this homework assignment have to do with the TAPP app? You know of at least one way to listen to a podcast, otherwise, well, you wouldn’t be hearing me right now, right? Even though a lot of folks out there know what a podcast is, sorta, kinda, a lot of people really don’t know how to take that first easy step of actually accessing their first podcast, much less hitting the button to subscribe to it. But apps, everybody knows how to download an app, right? You can just tell your peers to go to their app store, search The A and P Professor and download the app. That’s it. Kevin Patton: Another, almost as easy option, is to get them to use the app right on their phone. I did this just a couple days ago on the phone with my friend Maureen. I had her open the podcast app that’s already on her iPhone. All iPhones and iPads already have it automatically installed by Apple, and then search for The A and P Professor and subscribe. It works the same on Android devices, which all now have the Google Podcasts app automatically installed on their devices. Well, except for Kindle Fire, there you have to install a podcast app such as Overcast, or Castro, or Stitcher, or one of the many other podcast apps, or radio apps that there are out there. Yeah, okay, there are a lot of other options, even getting the podcast by email to listen on your mobile device or desktop computer, or Alexa. But remember, not by carrier pigeon. Just go to theapprofessor.org and click on the subscribe entry, under podcast, in the top menu bar. And don’t forget your homework, just one colleague, just tell one colleague about this podcast. And before you ask, if you tell two colleagues, yes, you’ll get extra credit. And, as always, thanks for your support. Kevin Patton: Today’s featured segment is a chat with my friend Aaron Fried. I know Aaron from the Human Anatomy and Physiology Society, or HAPS. He’s an assistant professor of anatomy and physiology at Mohawk Valley Community College in upstate New York. Besides a lot of experience teaching A&P, instructional design, and teaching methods, Aaron is dedicated to the use of human donor dissection and human and animal tissues for learning and instruction, and is a national speaker on the history of body donation, specializing in the history of body use in Nazi Germany. Kevin Patton: Well, hi Aaron. It’s really great to talk to you again and welcome to the podcast. Aaron Fried: I’m excited to be here. Kevin Patton: Well, I think we need to just jump right into it. This is going to be a two part conversation. We’re going to do the first part in this episode and then in the next episode we’re going to do the second part. The two parts do hang together, but you’ll need to listen to both parts to see how they hang together, and where we’re going to go with this. 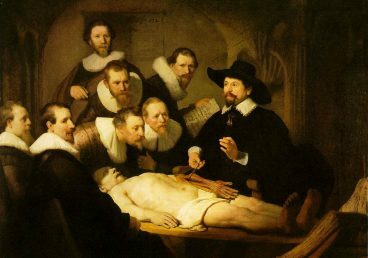 Kevin Patton: At some level, I think we all know that cadavers used in anatomy education are the remains of real people, with real lives, and real families and friends. But, I wonder how much of that really sinks in. I know you’ve given a lot of thought to that and even speak about it to anatomy educators. What is it you feel that’s important to share about using human remains in teaching anatomy? Aaron Fried: Well, that’s a question I always love to answer. And, the other thing, I always like to catch people in a trap and not tell them beforehand, but I actually don’t prefer the use of the word cadaver. We try to work with our students and have them describe them as human donors and I’ll circle around to that in a little bit. I’ve been lucky enough, when I took anatomy as an undergraduate, worked in a program where we had one human donor that we worked with, was as a prosection, and then I’ve been at Mohawk Valley Community College for the last nine or 10 years and we are gifted to have this program at our school where we get, every year, four or five donors, that we get some of our best students to come back from the year and they go through a course with us where they do the dissection and then we have those donors, as prosections, to work with our anatomy one and anatomy two students over the course of the year. Aaron Fried: We have this program where we call those our “silent teachers” and that’s actually something that originates well before my time here. A HAPS member, retired from our campus, Bill Perrotti, actually brought this into the program when they started this. The idea that these are individuals who donated their body after they died in order for us, and for our students, especially. We have a lot of students who are going to go on and become health professionals, nurses, radiology technicians, respiratory therapists, to learn from and to be able to continue this knowledge that we gained in anatomical sciences as a foundation for health professions. We actually go so far as to give our students the first names of our donors to show that there’s a dignity and respect to what we’re doing and that it’s important for us to both honor and respect as we learn from their tissues. Aaron Fried: The story goes from when the first year they had the donors another former HAPS member, Sam Drogo, passed away a few years ago, the first year that we had donors in our lab, one of the donors was his fathers roommate in palliative care. Then, in the fall of last year, actually had a student who was a CNA in a palliative care facility, took care of one of our donors at end of life. It really hits home that there is a huge human connection when you can look around the room and say to the other students, this is an important gift that someone gave us after they were done with their body so that we could use it to learn. Kevin Patton: Yeah. I kind of had an experience like that myself in that I’ve had family members, including my own father, when they passed away, they left their bodies for medical education. Actually, at the university where I was teaching, I was teaching in the physiology department at the time so I was never in the lab, but, I thought about them being over there and being used that way. Even though I look … looking back, I feel like I’ve always tried to be respectful of the lives of the people who made these donations so that we can use them in teaching and learning. It wasn’t until I had family members that I knew were over there in the lab and I knew were being used this way that, that idea really deepened in me and I really can’t not think of that when I’m dealing with human tissues. Now, you have the opportunity to use … well, I almost said cadavers. Aaron Fried: Yeah, it’s hard, and we struggle all the time. We say it, and you know … as a little bit of background … and I know this is going to be the second part of our talk, but, so I do research into Nazi anatomists and as I was talking to a specialist in the field, Sabine Hildebrandt, who was actually from Germany, she said the reason that she doesn’t prefer the use of cadavers is because the way that they would view that in Germany is that cadaver is a term that is like refuse, it’s like trash, it’s like something you throw away. I actually went, after that interview, and I looked up the etymology of cadaver and I think this is always disputed, and I’m not a linguist, but I think you go far enough back and now we say cadaver is some … from some translation like, from the remains, but I actually think it means something more like, from the earth, or something a lot more like that from the trash connotation. It’s tough, but that’s why we try to … I’m actually shocked this year with our students that, because they’ve never really had the use of that term cadaver so much, they use the word donor almost effortlessly. It’s nice to be able to see that once we put that emphasis on it, it’s easier for the next generation to pick that stuff up. Kevin Patton: I think that’s a great approach and, you’re right, it is kind of hard to shed what we’re used to. But, on the other hand, it really is important how we say things. That really does imply some thoughts and feelings and attitudes when we do that. I’m all for it. I’m gonna really focus on using the term human donors. And, you have human donors, but we don’t have human donors in our school, except, I guess we do, I think we still do have one human skeleton and … actual skeletal material and I think we have some skulls, natural skulls. Most of that has been replaced over the years with plastic reproductions. Even in using those plastic reproductions, it’s a replica, and I use models, and so on, but those are all based on cadavers, and much of the art we use in our lab charts, and our text books, and anatomy atlases, those are drawn directly from, or at least indirectly, from the remains of real people. Aaron, do you see any issues regarding what we ought to think about as we use these sort of derivative materials? Aaron Fried: This is one of those things where sometimes I always wonder if I’m searching for ethical issues because I’ve been studying the Nazis. I should describe my desk before I answer this question because, as I look straight in front of me, Halloween is the best holiday for anatomists because I can go anywhere and look at what would be a great anatomical specimen for me to put on my desk. Aaron Fried: I have a fake a skeleton hand on my card … my index card holder. I have a skull that I picked up, I think I was with my wife at Michael’s, and the reason I grabbed this skull is because it is suture to suture almost a perfect replica of an actual skull and it’s labeled well, and you know, you’re right, these are things that come from … their derivative at some point of an actual individual. Aaron Fried: Sometimes I’m always wondering, especially when I travel, I try to go a lot to anatomical museums or you’ll run into oddity shops where people are actually selling human tissue. I was actually in Baltimore this summer and I bought a student box of brain tissue from an oddity shop that, in a way, I felt like I was rescuing, because I was at least able to bring back into education so that we could use these slides. But, these are human pieces of tissue, real human beings that … in that slide box, in that brain slide box that you … I always wonder, did this person intend for that to be the case? I see images of a skeleton posed in a certain way, a real human skeleton posed in a certain way, and I think of … there’s some dubious history to where specimens came from at certain times in our past with skeletons. Aaron Fried: You said you have a human skeleton in your lab. We have as many human tissues in our labs as possible. We have plastinations. With skeletons, there was a whole period of time where, in India, there was a bone trade where people were being murdered so that they could clean the bones and sell the bones. It’s likely that in collections all across the United States, there are individuals who, potentially, were part of that unsavory bone trade. With plastinations, for example, we actually just got some new plastinations in our lab and they’re wonderful because it’s real human tissue. You can see the real variation. You can see the real contours, the real lines. Aaron Fried: It also makes me think of the Body Worlds and Bodies, The Exhibition, and all of those plastination exhibits, and there’s lots of anatomical drawings that have been done historically. I think originally a lot of artists who were drawing anatomy, trying to be anatomists, were drawing art to get away with doing anatomy. That’s led to this looking at the human body and the form as this beautiful artistic representation. So you go to this plastination exhibit and you’re looking at real human bodies, but we see it as this breathtaking artwork and we don’t think about, well, hey, where did those bodies come from? Is this an actual individual who consented that this is what their tissue should live on for?. Does creating an artistic representation degrade the humanity of the subject? I’m always constantly thinking of that, and I, over the summer, one of my … this is … I always think it’s funny to tell people that my for fun reading, I read about anatomy, but I read a biography of Gray’s Anatomy, which is a historical anatomical atlas. Aaron Fried: It was interesting, for a couple of different reasons, one, it was common at the time for … Gray’s Anatomy, the anatomist, it’s the story of the two Henry’s that were involved in creating the first Gray’s Anatomy, Henry Gray, who we actually don’t know much about because he didn’t keep a diary, and Henry Van Dyke, who was the artist who kept detailed diaries and that’s really what the story told. The author, Bill Hayes, actually went to University of San Francisco Medical School and took several dissection courses. One of the things that’s interesting is to think about someone who’s not necessarily an anatomist going through this experience, and one, seeing the amount of information he learned from actually doing dissections, which is one importance, but two, the reverie that you get from working with a human, realizing it’s a human. It’s kind of a constant thing in my head as I look at specimens, even as I have a … I’m describing this skull on my desk and I’m looking at, it’s clearly modeled after a real human skull. This is not a human, it’s not an actual human skull, but does that … is this an artistic statement that inspires people to think that this is a macabre oddity that I should strive to put on my desk or have and cherish. It creates an ethical question, and I won’t say dilemma, but question, about what the effect of these drawings have outside of learning. Kevin Patton: Yeah, that’s a really good point about this dilemma that we have, and feel that because, in a way, there are these cultural things that we do, not just with Halloween, but there’s the Day of the Dead and various other ways that we use representations of human remains, that we can’t dismiss that … these cultural traditions. But on the other hand, I think when we put on the hat of an anatomy teacher and the hat of an anatomist, then maybe we have some extra responsibility to think harder about that and especially in the way that we relate that. I know that in my own courses that the rule in my lab, and in my class, and that was, we don’t put silly hats on the skulls and take selfies with them and so on because that’s not respectful. Kevin Patton: Not only to the families of the human donors, but for potential new donors. I might think, I was going to do that, but if this is what happens in the lab at that school, I’m not donating my body there. Aaron Fried: Absolutely. I think you brought up cultural differences and I think one thing that’s interesting is, you look at like … you mentioned Dia de Muertos, and that’s an interesting cultural … it’s like a celebration. It’s a connection that the people of Spanish heritage have with their relatives and ancestors. And in the US, I think one of the things that makes some of the stuff that we do with the body so odd is that when people die, we immediately … we take the body away and it disappears and it doesn’t come back until … sometimes it never comes back. If people aren’t viewed before cremation for example. Or, it doesn’t come back until it’s been prepared at a funeral home and it’s … death is like this weird thing and I find that a lot of times people will look at what I do as an anatomist who does dissection of humans, as this kind of weird thing. And it really isn’t. It’s just … as people, culturally, view it differently, as some weird thing to them. So, the more we can make it a real normal thing when we talk to people, but also kind of a serious thing, hold ourselves to higher levels of ethics, higher standards when we do that type of stuff. Kevin Patton: Sure. Well, the lab at your school, I’ve never actually been on your campus to see it, but I’ve seen pictures and I think even some videos when it was first built, I think Bill Perrotti was sharing some of those at HAPS, and I’ve seen presentations that you’ve done where you’ve shown us some parts of the lab and there’s kind of … you folks have been very conscious about this whole idea of respect for the human donors, and even the design of the lab and that you’re entering a sacred space and even have some signage and so on that prepares the student, before their first visit, on the kind of thought processes and conscious framework that ought to be developed before they go in. Aaron Fried: We’re a pretty small Community College and we’re in a pretty small city in upstate New York and so, it’s no surprise that we have a donor lab on campus. Everyone knows about it. When we were able to design our lab, we got very, very lucky. We have two separate … we actually have three separate rooms. We have an outer lab that students come into first, where we do our physiology, or where we work with our skeletal remains, and then from there you walk into our inner lab where the donor room is and we have … hospitals have donated us old surgical lights for overheads. We have a walk in cooler for storage and then we actually have a third prep room behind that that we can store chemicals and store materials in. Aaron Fried: When students walk in from the hall, the first thing they’re greeted by is a “silent teachers” memorial plaque that was actually donated by one of our students a couple of years ago, that we’re lucky enough to have the names of all of our donors that we’ve ever had here. That’s the first step that students have. Then, as you walk from our outer lab into the actual donor room where we work with the donors, we have a couple of important signs. We have a “silent teachers” message, from the dead we teach the living, and that’s that respect step as we go into that space where … and this is another idea I know I already mentioned Sabine Hildebrandt, she liked this idea because, in medical school, when they do gross anatomy, a lot of times they refer to the donor as first patient and she actually thinks that that increases the anxiety and stress for a medical student because patients are real and living, and there are consequences to your decisions. Aaron Fried: She likes the idea of “silent teacher” because they’re not able to talk to you, but what you do is you learn from the actual anatomical dissections. You learn from doing … a patient will come in and we have their death certificate and it says, because of the way that a donor is prepared after they die, for the preservation, it has to … a person has to die in, usually palliative care, or in a hospital, attended death. They had … the body has to be processed within a short period of time. A lot of times … their can’t be an autopsy, so a lot of times death certificate says person died of cardiac arrest, or person died of a respiratory arrest, and essentially, that’s the way everyone dies is their heart stops or they stop breathing. But, sometimes we’ll have some indication of, they had these symptoms, or they have this condition they were being treated for. Aaron Fried: But essentially, what we get to do is go through and say, well what can we see? What do we notice about this individual? What can this individual tell us? I think that’s an important idea, in terms of … a part of it is respect, we respect them as a teacher, but, part of it is they don’t have a voice anymore, so what we … the best we can do is we can learn from what their anatomy shows us and again, I think we’re gifted to not … we don’t use the anatomical models, which I don’t think are bad, but they’re almost perfect representations. They can be corrected, they can be fixed, they’re color coded. Then, when we go to our donors, you go in and you look and the stomach isn’t blue, and the liver isn’t brown, and the … well, I guess that’s a bad choice because the liver is kind of closer to brown, but, you get the idea that there’s not exactly this perfect representation and we have to know, well, where are we looking? What type of things should we be looking for? Oh, this is very different than what we were expecting. What might that mean? Aaron Fried: Those are the types of things that we try to pick up on. There’s a surgical scar here. Where does that lead to? There’s all of this teaching that those individuals are doing from us year to year that we are able to pass on to the students, which is, I think, way more beneficial than this … just focusing on … we try to get our students, they’re like, “This doesn’t look anything like the book.” Yeah, of course it doesn’t look like the book because the book is perfect. It’s like this great teaching tool, and so, it’s … we’re wonderful to have that opportunity. Kevin Patton: You know, muscles are hard to figure out in a cadaver that’s not very … where the muscles are not very well developed, so I want to build them up because I want to be a good teacher. I sometimes think about my own body like, well, what are these students going to be saying when I pass away? I need to take care of myself. Aaron Fried: Yeah, take care of yourself. Yeah. The … I went and visited Mark Nielsen out in Utah last year and he has … they have a wonderful donation program out there, but it was probably one of the younger donors I’d ever seen, and I think he was a 56 year old male, but when he passed away his muscles were just in incredible shape. I was looking at this gentleman and I’m thinking to myself, wow, I’ve seen pictures, but is this really what this is supposed to look like? We … you get used to looking at a lot of elderly people who, a lot of times, have been bedridden for a period of time and the muscles are difficult. So yeah, it’s interesting to see how things vary from person to person. Kevin Patton: Well, I could talk about this kind of stuff all day, but we have limited time, and that’s it for now. As I mentioned at the beginning, we’re going to have a second part, and Aaron has already mentioned, he’s done a lot of work looking into some of the Nazi anatomists and some of the ethical issues involved with that. That’s what we’re going to explore in the next episode. I hope you can tune in then. Thanks Aaron. Kevin Patton: By the way, Aaron is available for speaking engagements anywhere, so feel free to contact him using the information in the show notes and at the episode page at theapprofessor.org. Kevin Patton: Hey, don’t forget, I welcome your comments and questions, just call 1-833-LION-DEN. That’s 1-833-546-6336, or email at podcast@theapprofessor.org. Kevin Patton: This episode may be taken with food to lessen the chance of stomach upset. Hi, this is Kevin Patton. Welcome to the first episode preview for The A&P Professor podcast. This is an experiment to see if doing a preview is helpful. You could say that it’s the preview pilot. Please let me know if it’s helpful or if it’s annoying or a bit of both, just like a regular episode. In Episode 30, I remind you about your homework assigned during Episode 29, which is to tell at least one other A&P teacher about this podcast. So, ahem, you still have time to procrastinate on finishing your homework. I also mention a surprise about HAPS, the Human Anatomy & Physiology Society, and its relationship to this podcast. And I picked a couple of topics from the science news headlines. One is a update on how epigenetic inheritance works and the other has to do with what happens when our left-handed cells become right-handed cells–well okay not exactly that, but you’ll have to listen to Episode 30 to hear what’s going on. In my A&P classes, I like to let my students know about new terms ahead of time, breaking down the word parts so they get used to the language of A&P and don’t fumble over the terminology when they are learning new concepts. I know y’alls know this stuff already, but I thought it be a good reminder for us to do that with a couple of terms that will come up in Episode 30. The first is the word epigenetic. It is made up of the word part “epi” which means “upon”, “gen” which means “make,” but in this case refers to “genes”, and “ic” which means “relating to.” So epigenetic inheritance is not transmission to offspring strictly by way of the genes, but instead some factor operating “upon the genes.” Epigenetic-upon the genes. The second word is chirality. “chiro” means hand, “al” means “relating to” or “having the characteristics of” and the “ity” at the end refers to a “state of being.” So chirality could be translated as “the state of being like a hand” but in this case refers to what some people call “handedness” which is whether we prefer using our left or right hand to perform tasks. Handedness or chirality is the term we use to describe the dual mirror-image versions we sometimes see in nature, such as with asymmetric molecules that have the same chemical properties but are mirror-image versions of one another. The featured segment of Episode 30 is the second of two chats I had with Aaron Fried, who explores the use of human body donors, particularly among the Nazi anatomists in the 20th century. In Episode 29, we talked about issues related to using human body donors in anatomy education. In Episode 30, Aaron talks about what he’s learned about the artwork produced by Nazi anatomists and why it’s important to know about that history when teaching anatomy today. By the way, related to the topic of human body donation, I want to mention a book I’ve been reading, and which I highly recommend. It’s called The Silent Teacher: The Gift of Body Donation. It’s written by Dr. Claire Smith, who is the Head of Anatomy at Brighton and Sussex Medical School in the United Kingdom. The title of her book incorporates the term “Silent Teacher” which was how we referred to human body donors in Episode 29. This term stresses the humanity of the donor and the critical role that donor plays in the society. And that’s the core message of this book, I think: that critical role of our silent teachers in teaching health professionals, which in turn translates into assisting in the health and wellness of countless millions of us who benefit from health care strategies. As I’m reading the book, I was thinking that because I’ve had family members who became body donors and both my wife and I have made arrangements to do that ourselves, this would be a great book to help other family members understand our decision and not only accept it, but embrace it. But as I continue to read it, I’m also thinking this would be great for A&P professors to read, too. For those of us who don’t do human dissection in our program, it’s a good background so that we can accurately explain the process to our students. For those of us who do use human body donors, this book will help us understand the perspectives of the different stakeholders involved so that we can effectively explain what we do with our students, colleagues, and the community at large. But that gets me to thinking that this book would be great for our students, too. It will help prepare students as they get ready to have their first experience with a human body donor. But even students who don’t have that opportunity will see how human science works, why human body donors are important, what actually goes on in anatomy, and perhaps become interested in anatomy as a career, or even becoming a body donor themselves. You probably didn’t even know that The A&P Professor Book Club even exists. But it does, and this book is definitely on the recommended list! Check out the links in the show notes or go to theAPprofessor.org and find Book Club in the menu. Now might be a good time to go back and listen to Episode 29, so you’re all prepped and primed to get the most out of our discussion in Episode 30.